The Say: One outstanding pick if you are in the market for a mid-size SUV. Based on the Ford Ranger/Mazda B Series pickup truck, the Everest utilized its underpinnings to create a vehicle whose purpose is to transport people and having one advantage, a cheaper price. 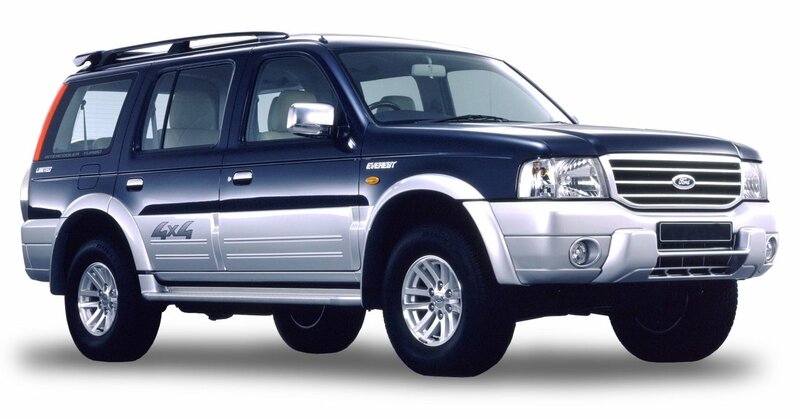 Prior to this vehicle's existence, the Mazda Proceed Marvie and its Ford Raider twin were sold during the 90s which could be considered as its spiritual predecessor. Compared to rivals from Toyota and Isuzu that were launched at the same time period, this one had a 12 year run which meant the shape is the same but having treated to some exterior updates and it is the true with the inside to keep up with the times. Grille and all wheel designs differ from several years while some exterior designations were done to distinguish low models from their top end counterparts. 2003 to 2006 4WD models have a sticker at the lower side while later ones are known by their two tone color scheme while retaining the label. Limited models, launched in 2009, are distinguished by a badge and for later models, a rear spoiler. Earlier models utilize 15 inch wheels with later models having larger size ones. Lastly, some exterior cues from other Ford models were placed in 2009 and up models to keep the vehicle fresh. Most units have a 2.5 engine under the hood that had evolved from the use of a distributor type to slapping common rail direct injection technology but do take note that 2003 to 2006 models use a different engine against their 2007 to 2015 counterparts. A second option for later units is a 3.0 coupled with CRDI technology which comes standard for 4x4 models. First 2.5 models (shared with several Ford and Mazda vehicles) are unrefined and carry an optional automatic transmission which does not fit the engine's personality but it is one dependable beast plus it has some decent acceleration to tap. 2.5 engines with CRDI are a much better bet, especially that it is powerful enough for city driving although you need some push to make this engine lively. Choosing the 3.0 will reward you with more power despite the added heft of a 4WD system. Speaking of the 4WD system, 2003 to 2006 models utilize a lever type while later ones have a flick switch situated in the transmission area. Earlier models have a smooth ride with later ones became either floaty (2007 to June 2009) or more choppy due to its larger wheels (June 2009 to 2015) but these absorb road ruts. Thankfully, steering this SUV is on the light side which is a far cry from its pick-up genes. For the first two rows, they are roomy to be in but the third row is best left for children especially that is raised. Earlier models suffer from cheap interior trim which was improved in 2007, which makes them better options. Good thing that ergonomics and seating position is livable but it sits low similar to its peers. Like we said above, the interior is updated throughout selling life. 2003 to 2006 4x2 and 4x4 models have different standard equipment compared to later models so let us delve one by one. 4x2 models sold from that period get a 110hp 2.5 diesel, dual airbags, CD player, alarm, keyless entry, and side step board while 4x4 units add ABS brakes, fog lamps, and auxiliary jack with leather seating an option for automatics (added in July 2004) sold from September 2005. An update starting January 2007 had the 4x2 (later dubbed the XLT in June 2009) models wear the 143hp 2.5 engine, dual airbags, ABS brakes, limited slip differential, fog lamps, side step boards, roof rails, CD player with MP3 function, alarm, and keyless entry with items such as an auxiliary jack (June 2009) replaced by a USB port (April 2013), and steering wheel audio controls (April 2013) were added later on. The 4x4 (renamed as the 3.0 Limited) adds side airbags, reverse parking sensors, body cladding, leather seats, and a 156hp 3.0 paired to a 4WD system. A 2.5 Limited has the items of its upper model but is 500cc less and drives the rear wheels. An ICE package sold from March 2009 adds a DVD player with front and rear LCD monitor, Bluetooth, and for 4x4 models, reverse camera. When it comes to keeping costs, 2003 to 2006 models are cheaper to maintain than those with the CRDI technology. Underchassis parts are different from the two models but the price difference isn't big. Problem points to look at include the following: glow plugs for first releases and dual-mass flywheel if you aim a 2007 to 2015 manual. With changes involving more of cosmetic and equipment than mechanical, focus more on the vehicle condition and be picky, since its twelve year run will result to numerous units in the used car market.